There's nothing more terrifying to a novice Wedding MC than being handed hastily scratched notes of the wedding agenda and being expected to put on a brilliant performance from start to finish...especially when you've never MC'd a wedding reception before. After all, you don't know what to do...or what to say in front of hundreds of guests. I'm Mark Livingston, and I’m going to show you - just like I have done with hundreds of other Wedding MCs - how you can unleash your untapped talent as a Wedding Master of Ceremonies and turn a so-so (or even a dull and boring) wedding reception into a FUN and memorable time for everyone. You don't need years of experience as a Wedding MC to pull it off. All you need are enthusiasm and the right "blueprint" - a carefully prepared guide that takes you by the hand virtually every step of the way from the beginning of the wedding reception to the final farewell. Let me tell you, there's nothing more thrilling than hearing wedding guests laughing and seeing them having an amazing time...all because you were responsible for planning and creating a FUN reception. What's so amazing is that virtually any Wedding MC - inexperienced and experienced - can turn an "ordinary" wedding reception into a FUN and memorable time with just a few simple-to-implement secrets. It's like unlocking the secret code that ramps up a formal, dignified reception and turns it into a full-blown party…and a celebration of the newlywed's special day. In fact, no matter how experienced you are as a Wedding MC, it's amazingly easy when you know what to do and you have the right tools to work with. How To Be A FUN Wedding MC is jam packed with checklists, activities, scripts, and step-by-step procedures that guide you through the wedding reception from start to finish. There's no guessing what you have to do…it's laid out for you from one major reception event to another. Your lifeline for ensuring the wedding reception runs smoothly is your Wedding Reception Agenda or Run Sheet. Without the detailed Wedding Reception Agenda or Run Sheet I provide, you'll be completely and utterly lost…and the wedding reception will limp along to its boring conclusion…and be a disappointment for the bride and groom. Don't know what to say as a Wedding MC? Well, I have the bases covered with sample scripts you can modify and use at the reception…including word-for-word scripts for the Bouquet Toss, the Garter Toss, and cutting the Wedding Cake. Your Wedding MC Duties begin several weeks before you finally reveal the celebration of a lifetime to the bride and groom. Our Wedding Reception Timeline is a key stress reliever as it keeps you on track and outlines the "when to do what" sequence of events that lead up to the wedding reception. Now you can stand confidently in front of hundreds of wedding guests and know exactly what to say to get the wedding reception underway. Our word-for-word script - The Wedding MC Welcome Speech Script - shows you not only how to welcome the wedding guests at the beginning of the reception but also how to get them into a party mood. It's been carefully compiled into a comprehensive blueprint specially for the Wedding MC who wants to excel at creating a fun wedding reception. But I don't want you to feel overwhelmed or intimidated simply because How To Be A FUN Wedding MC is so thorough. That's why I've included a Quick Start Guide. To get you off and running to a quick start I've provided a list of key areas you MUST do to be properly prepared for your Wedding MC Duties and Responsibilities. Plus, i've also included a special "How To Use" page that zeroes in on the critical parts to start with so you get involved in your Wedding MC Duties fast. Because being a successful Wedding MC means being on top of virtually every detail up to and during the wedding reception. Here's how to create a working plan for your Wedding Agenda quickly and easily - a listing of virtually any main event you'll encounter at a wedding reception that you can check off and add to your own Wedding Agenda or Run Sheet. Venue Checklist For "Setting The Stage"
The venue - and the reception room in particular - will be your "stage." That's why it's important to ensure that everything is in order and ready before the wedding guests start walking through the door. My Venue Checklist covers the key items you should check at an indoor - or outdoor - wedding reception to ensure the reception room or area is ready for a party. Music and dancing play such an important role in the celebration at the reception. That's why I've created a special worksheet with events and scripts that not only turn the dancing into a party time but also provide the bride and groom with their first romantic moment together as husband and wife. This loving way of saying goodbye to the bride and groom is the perfect end to a fabulous wedding reception. Our Farewell Circle Worksheet takes you through all of the steps to give the bride and groom a memorable send off. If you're like me, you like things to go smoothly. But sometimes that doesn't happen. Delays. Bad weather. Equipment malfunctions. And other disasters. They're all part of a wedding reception...even with the best of planning. The good news is that unexpected "surprises" don't have to spoil a happy time at the reception when you`re prepared. Our detailed list of 25 potential problems you could face at any wedding reception helps you plan for catastrophes that could easily ruin the bride and groom's special day. ...including what to say in your closing remarks...essential items to take to the wedding reception so you're fully prepared...and a final checklist to make sure you're ready for your Wedding MC Duties. I like to think of How To Be A FUN Wedding MC in much the same way a NFL quarterback views his playbook. A team's playbook is more than the accumulated years of knowledge and experience all neatly arranged and tabbed in a three ring binder for quick and easy reference. And it's valuable beyond compare. No football player would ever dream of stepping onto the field without knowing his plays from the team's playbook. It's one of the most important things that can lead his team to victory...and the recognition and accolades that come from winning. Just as an NFL player has to know the plays in his playbook from start to finish, so too the Wedding MC has to know the events and activities at the reception from beginning to end. You're the reception's quarterback - the key player who oversees virtually everything at the reception from the moment the bride and groom make their Grand Entrance to their big sendoff in the Final Farewell. Your special MC "playbook" is the gateway to lifelong cherished memories for the bride and groom and their families. You call the plays just like a quarterback shouts out the plays on the field in the heat of battle. And the success or failure of the reception lies squarely on your shoulders. Without your MC "playbook" you're likely to be lost. ...Instead of a well-oiled machine. >> Want to get up to speed fast? Then scroll down to your Quick Start Guide. >> Want to know what reception events to include? Look them up under the Reception Events Checklist and create your Wedding Agenda or Run Sheet using the samples already prepared for you. >> Nervous on the day of the reception? There's no need to be because you'll be fully prepared and confident with your Reception Venue Checklist and your Wedding MC Essentials Checklist. >> Want to know how to entertain the guests with wedding games and activities? Open up your FREE Bonus, the Wedding MC's Secret List of FUN Ideas, with more than 50 games, activities, and fun ideas, and start planning a FUN celebration. You'll instantly see what you have to do to get things underway as a Wedding MC. This isn't some lame "laundry list" of Wedding MC Duties that leaves you completely baffled. Instead, it's a "roll up your sleeves and let's get busy" approach that gets you started from the moment you download your copy of How To Be A FUN Wedding MC. You'll immediately know where to start and exactly how to wind up the wedding reception at the end of the day or evening. As Wedding MC you'll carry a lot of responsibility on your shoulders. How To Be A FUN Wedding MC takes the pressure off with its easy-to-follow and easy-to-use format that you can immediately put to use. You'll get my most important - and effective - tips and suggestions to make this a fun and entertaining event instead of a collection of long-winded and embarrassing wedding speeches and toasts. I include the traditional and non-traditional Order of Wedding Toasts. Not only that, but you'll also get my suggestions on how to order the wedding toasts (and speeches) to make it a FUN wedding reception. Part of the secret to being a FUN Wedding MC is knowing how to "kick" the wedding reception into high gear for a fun time. You see, most newlyweds spend thousands of dollars on the wedding reception and yet they don't know how to create a fun time. And many later regret they didn't spend more time planning a fun celebration instead of a wedding "reception." And that's where you come in - armed with the secrets from How To Be A FUN Wedding MC. Even if you've never thought of yourself as an "entertainer" it's surprisingly easy when you have powerful ideas to work with. Imagine experiencing the THRILL of hearing a room full of strangers laughing and having a good time...knowing they are thoroughly enjoying themselves at a wedding reception that's talked about weeks, even months, later. Who says you can't surprise and delight the bride and groom as a FUN Wedding MC and still make them the center of attention? A wedding reception doesn't have to be dull and boring. And one of the best ways to liven things up is to have talented wedding guests contribute to the entertainment. Our select list of wedding entertainment ideas gives you the opportunity to involve the wedding guests and kick things up a notch for ultimate entertainment value. Worried about having "lulls" and boring spots during the wedding reception? There's no need to be anxious - that's for other Wedding MC's who prefer to go it alone without the help of How To Be A FUN Wedding MC. With this specially chosen group of fun activities you'll be able to entertain the wedding guests from start to finish. Our detailed preparation forms are the KEY to creating a fun time. They list the most important questions to ask the Bride and Groom, Wedding Planners, and Speakers...as well as the main Vendors you'll be working closely with before the wedding reception. This is critical information you MUST have to ensure everything runs smoothly and ensures the reception is a memorable time for the Bride and Groom. From the Bride and Groom…to Bridal Party…to Speeches and Toasts…to Special Acknowledgements…to Dancing…our hands-on "Help Sheets" are one of your most valuable aids as you create the celebration of a lifetime for the bride and groom. You'll know how to "ratchet up" your introductions including welcoming the Bridal Party and formally announcing the bride and groom as they make their Grand Entrance. Plus, you'll have the wedding guests eager to hear humorous wedding speeches as well as poignant toasts when you introduce the wedding speeches and toasts portion of the program. It's a special moment for the bride and groom to hear from those who couldn't make it to the wedding. But you're going to go the extra mile and make this a fun event, too. So why not liven things up as you "plant" fake telegrams and emails and insert them with authentic good wishes from absent friends and family? What better way to get things off to a fun start than with introductions as the bridal party and bride and groom enter the reception room. How To Be A FUN Wedding MC is specifically designed for English speaking countries including Canada, United States, Australia, New Zealand, South Africa, United Kingdom, Europe, and the Caribbean. You could spend hours and hours trying to figure out where to start, what to do, and what to say at the wedding reception. Instead, I've made it quick and easy for you to get "up to speed" as fast as possible. >> How to plan a FUN wedding reception with more than 50 FUN games and entertainment ideas. Everything is laid out for you and shows you what to do. PLUS, you'll also get the special Wedding MC timeline, sample scripts, sample agendas or runsheets, and much more. I believe in over-delivering and giving you top value with details and ideas you probably never even thought of. 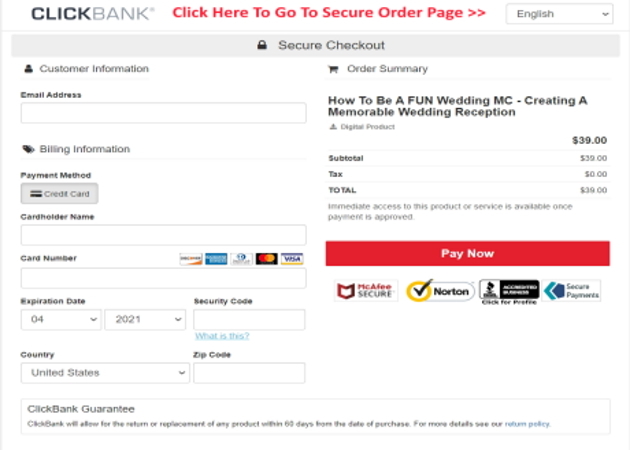 Once you've seen how comprehensive How To Be A FUN Wedding MC is, and how much quicker, easier, and less frustrating it will be to prepare for the events at the reception, I'm sure you'll agree that at $39 it's well worth it. And I'm sure you'll also agree it will be your indispensable guide as you follow the checklists, scripts, procedures, and ideas in making the bride and groom's wedding reception a resounding success. Try How To Be A FUN Wedding MC with NO RISK . . .
Use the checklists, preparation forms, ideas, and suggestions as you prepare for the wedding reception. If at any time during the first 60 days you’re not completely satisfied with How To Be A FUN Wedding MC simply let me know and you’ll get an immediate, no-hassle, no-questions-asked refund. You have nothing to lose...except the opportunity to create a memorable time for the bride and groom at their wedding reception. How To Be A FUN Wedding MC by itself has everything you need to make a wedding reception a rousing success. But I want to take it “over the top” with Exclusive Bonuses you'll only find here. As Wedding Emcee you're going to be wearing a number of "hats" - you'll assume the roles of organizer, co-ordinator, and - most importantly - Entertainment Director. And it's as an Entertainment Director - and how you bring the party to life for the bride and groom and their guests - that you'll be remembered for. The Wedding MC's Secret List of FUN Ideas is a select group of super-powerful party, entertainment, and group activity ideas that help you elevate a normal wedding reception to a memorable event. There's no guessing "what to do." Everything is laid out for you: More than 50 games, activities, and fun ideas for adults (and children, too) that turn the reception into a memorable time. This list by itself is worth its weight in gold if you want to "ramp" up the fun at the reception. Whether it's a spring, summer, fall, or winter wedding, the Wedding MC's Secret List of FUN Ideas includes indoor activities, outdoor activities, and even activities the kids can participate in if there are children at the reception! You'll have instant access to these little-known secrets from the Wedding MC's “bag of tricks” when you download How To Be A FUN Wedding MC. In this concisely written report, you'll discover the 6 Key Areas that have the greatest impact for creating an amazing reception and a fun celebration. Of course, each one of these Key Areas by itself can have an impact on the reception. But combined they can become the "secret formula" you've been looking for to create a memorable occasion for the bride and groom and their wedding guests. The "Just Married" game played by the bride and groom could very well be the first of many unforgettable moments of the reception for the newlyweds. It's a popular and highly entertaining game enjoyed by the wedding guests and you'll have a step-by-step blueprint on how to organize it to make it even more fun. Many Wedding MC's need ideas to boost the “fun factor” - especially when it comes to keeping things entertaining. That's why we created this short skit to get your “creative juices” flowing. Use it, modify it, or create your own skit from the ideas you'll get in this delightful fairytale that's sure to get some laughs. I've included 5 MORE sample Wedding Reception Agendas or Run Sheets to model your own Wedding Agenda after. Whether it's a short afternoon reception or a longer evening wedding reception you'll have many more ideas to work with as you create a fun and memorable occasion. How To Be A FUN Wedding MC has been designed to get you "up to speed" and prepared for the wedding reception as quickly as possible. But it's more than checklists and procedures. It's a powerful step-by-step blueprint that shows you how to turn an ordinary wedding reception into a high energy celebration that leaves lasting memories. When you're standing in front of 50...100...200...or more wedding guests I'm certain you'll be glad you have How To Be A FUN Wedding MC as your guide. And you'll feel fully prepared for all of your Wedding MC duties and responsibilities. 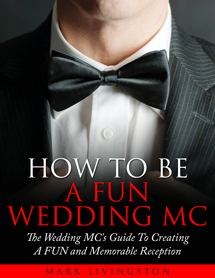 How To Be A FUN Wedding MC is your guide to becoming the Wedding MC who gives the wedding guests - and the bride and groom - one of the most entertaining experiences they’ve ever had…and leaves an unforgettable memory. And even though the bride and groom might be shocked as you reveal your latent talent, they'll also be amazed and very pleased. Because you'll have done exactly what they were hoping for - you turned their "reception" into a huge celebration with their closest friends and family on their special day. Get in the game with How To Be A FUN Wedding MC. Be the star quarterback who throws the winning pass instead of fumbling the ball and having victory snatched away with seconds left on the clock. Download your copy of How To Be A FUN Wedding MC today and start preparing an unforgettable wedding reception. I’m sure you’ll be very pleased you did. P.S. Do you know what it's like to see the wedding guests having fun at a wedding reception? Let me tell you there's nothing quite like the thrill you'll experience knowing you've created cherished memories for the wedding couple on one of the most important days of their life. Download How To Be A FUN Wedding MC today and I'll show you how to turn an ordinary wedding reception into a FUN celebration. My 100% money-back guarantee puts ALL of the risk on me...and makes it safe and easy for you to try it out. PPS. How To Be A FUN Wedding MC is thorough and comprehensive - it covers a wide range of wedding receptions from 50 guests to 300 or more wedding guests and is not suitable for smaller occasions. It's specifically designed for English speaking countries including Canada, United States, Australia, New Zealand, South Africa, United Kingdom, Europe, and the Caribbean. YES! I want to know the secrets to creating a FUN wedding reception so I can create a memorable time and cherished memories for the bride and groom and the wedding guests. Plus, I get your FREE Exclusive Bonuses to help kick the wedding reception into even higher gear and make it a FUN time! I'm fully protected by your 60-Day, 100% Money Back Guarantee. Immediately after you complete your order you will be taken to a secure login area where you will find your login details. You will also be emailed your login details for future reference so please ensure your email address on the order form is correct. Just wanted to thank you soooo much for making what could have been a complete disaster a fabulous success. Was asked to MC my nephew's wedding with 2 weeks to go. I purchased How To Be A FUN Wedding MC in pure desperation less than 1 week from my nephew's wedding. Totally new to public speaking with absolutely no Wedding MC experience. The overview you gave me and, with the prompts supplied, I was able to present myself as a very professional MC. From arriving early, meeting with the events manager and staff, marriage celebrant, photographer asking what was required of me and they were very impressed...greeting people as they arrived. Even practicing with the mic beforehand. Adapting your plan to the actual wedding plan given to me the night before the wedding...I was able to have a complete itinerary of what was going to happen and when. I was even prepared when the Grand Entrance music went missing 2 minutes before. All night other MCs were coming up to me and saying, "You have obviously done this before," in my head was thinking, "Thank you, Mark." The events manager came up to me at the end of the night (yes, I was the last one out the door) and said, "It's great to have an MC who does what he is supposed to do." Even the next day people were coming up to me and saying my presentation was smooth. Honestly, if I could, I'd give you a great big hug, I would. With the utmost respect and thanks. Disclaimer: Brian W. from Australia was totally new to public speaking with absolutely no Wedding MC experience. He was so thrilled with his results after using How To Be A FUN Wedding MC that he sent me this unsolicited testimonial. His results may not be typical and your results could vary. I recommend you order How To Be A FUN Wedding MC well before the day of the wedding in order to be fully prepared.